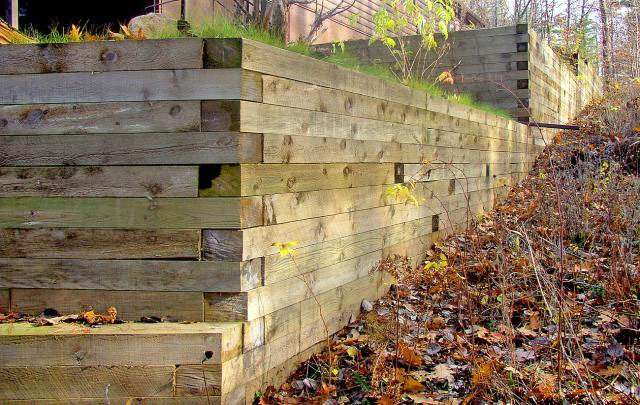 Timber retaining walls are the most affordable but least durable solution. Landscape timbers used for retaining wall construction are pressure treated much like a 2x4 from your local hardware store. That means they will have a very abbreviated lifespan as a retaining wall material; generally, five years or less. Landscape timbers should never be used when building retaining walls over four feet in height. Due to their high failure rate, numerous cities and counties no longer permit new or replacement landscape timber retaining walls over three feet in height. Home Owner Associations are also restricting homeowners from replacing old cross tie retaining walls with landscape timber. Modular block and concrete masonry walls are the only options being authorized within more discriminating HOA’s. In the past, cross-ties were used as an extremely effective retaining wall material. Regrettably, the EPA has since determined that what made cross ties so durable and long-lasting i.e. : arsenic, mercury and other heavy metals are no longer suitable to be used for retaining wall materials. 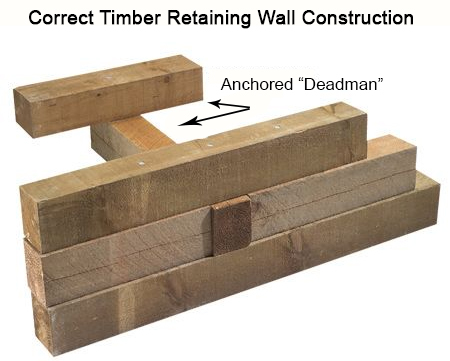 Should landscape timber be your only option for retaining wall material, be sure the wall is built correctly with “anchored dead men”. The anchors will ensure the very lightweight wood has the best chance at remaining sturdy and straight over the years as lateral earth pressure bears upon it. Problems with this type of wall include porous access prone to insect, small rodent and even snake infestations. As with any wood exposed to the dirt, rain and sun, cross tie and timber walls will eventually become rotten and fail; the time this takes is greatly dependent upon the climate.